I’m going to admit I had no idea who Clayton Anderson was when I requested this book, but it sounded interesting, and interesting it turned to be, indeed. There were plenty of little things I never suspected regarding life on the ISS, and in space in general, and I feel like I’ve learnt a lot. Which I’m sure is absolutely not going to be useful if I write a sci-fi story someday. Never. It’s a fast read, in Q&A format, which is ideal when, like me, you read a lot during breaks at work, or while commuting. No long chapters that make it difficult to stop (almost) any time. These cover a lot of various things, from how the human body reacts in space to the kind of operations astronauts have to be trained in, from the former space shuttle program to little things like ‘how to you wash yourself in micro-gravity’. 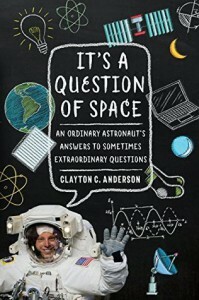 While I felt that Anderson might have misinterpreted a couple of questions (I’m thinking more specifically about the one regarding ‘what do you think of people who say the moon landing is a conspiracy’), overall his answers were simple and often full of humour. The man doesn’t hesitate to make fun of himself, and admits when he goofed on the station. He doesn’t always get into details, and he doesn’t hide it when he doesn’t know something, so perhaps some of the answers were a little lackluster; still, in general, this was fairly informative for me. Conclusion: 3.5 stars. And I wouldn’t mind reading his other book, for sure.